Sports Management is a practical degree that will prepare you academically and professionally to hit the ground running in the sports and leisure industries. QUIZ: Which management degree should you study at St Mary's? Sports Management is also available as an undergraduate degree with a foundation year. A Sports Management degree is particularly attractive to employers in the sports and leisure industries, both in the commercial and not-for-profit sectors. Studying this degree programme will equip you with the knowledge and skills required to successfully embark on a career in a wide range of roles and functions. A degree in Sports Management gives you the knowledge and skills you need to be a successful manager within the sports business, in a large or small company; in the private, public or third sectors; at home or abroad. It is centred upon contemporary management skills and approaches and will give you everything you need to succeed in the sports industry. There are excellent career opportunities for those who graduate in the field. Research conducted by Sport England shows that over 440,000 people are employed in sport-related jobs. The sports business is a truly global one and offers excellent opportunities for graduates to work internationally. A distinctive feature of the Sports Management programme at St Mary’s is that you will undertake a work placement as part of your degree, allowing you to combine academic theory within a practical working environment. Your placement will provide you with new skills, expertise and networks that can help to enhance your career opportunities within the sports industry. The sports business is a dynamic and rewarding industry and St Mary’s is the perfect place for you to begin your journey. London is the centre of the global sports industry (Sport Business International magazine labelled London as the worlds ‘Ultimate Sports City’ in 2012 and 2014). Where else do students have iconic sports venues like Wembley stadium, Wimbledon, Lords cricket ground and Twickenham stadium on their doorstep? Our programme provides you with the opportunity to visit these internationally-renowned venues during your degree, gaining a practical understanding of how they are managed. London is home to many of the biggest brands in global sport; a degree from St Mary’s will help you to relate to the specifics of sport in the wider context of management and the business environment. The ability to gain relevant work experience is vital for any student seeking a career in the sports business, as practical experience within the industry is required for many premium graduate jobs. The opportunities within London are unmatched within Britain and include a range of internships and placements. We have close ties with many organisations within the sports industry and regularly work with them to arrange student placements. St Mary’s University is a beautiful campus university in West London, with a friendly and professional atmosphere. 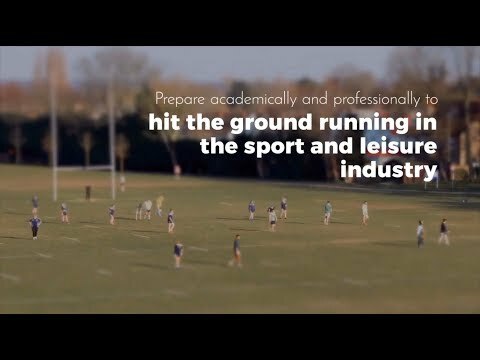 You will have the opportunity to immerse yourself in a sporting environment where you can join on University sports teams and utilise our world-class sporting facilities. 72 UCAS points should include at least a B and C grade at A Level (or equivalent). A GCSE in English and Maths to Grade C, or an equivalent qualification is also required. The undergraduate degree with foundation year programme offers applicants without traditional qualifications or grades an alternative route to studying Sports Management. This programme combines a general understanding of business and management with thorough coverage of key areas in sports business. From finance and marketing, through to strategy and social responsibility, you will move to focus on more specialist subject areas, including sports event management, sports journalism, high performance personnel management and sports law. This module will explore the strategic role of the human resource function from both an organisational and employee-centred perspective. The module will define the function of Human Resource Management (HRM) and analyse human resource planning. Particular reference will be made to the sports and leisure industries, drawing upon domestic and international aspects within a comparative framework. This module puts in context the different elements of the sports and leisure industries, both from the perspective of suppliers in the industry and from that of the end-users. The role of sports and leisure within the economy is also investigated. Other topics include the importance of sponsorship within sport, the role of globalisation, broadcasting rights, and managing risk in sport. The module aims to give students an overall understanding of contexts of sport (past, present and developing) in order to give students a thorough grounding in the areas of sports and leisure. This module introduces you to the social and cultural context of sport - from participation through to performance. This module aims to provide students with an opportunity to experience the workplace and to develop skills and knowledge in a relevant discipline. The module will help prepare students for the workplace by raising awareness of workplace issues, and encouraging them to reflect on their own personal and professional development. It will also help students to define and then develop the specific work-related skills that they need in order to become more employable. Students will be encouraged to share experience in order to encourage learning and to help them articulate their strengths. This module aims to introduce students to key concepts and models used in the study of the sports industry, whilst accelerating their ability to critically analyse information, data and theories. Students will be able to apply a range of business and management theories to a variety of sports industry case studies, drawing upon a range of different industry sectors in which they may be involved in their future career. Students will also be tasked with designing and evaluating a strategic business plan relating to a specific area of interest within the sports industry. This module provides an insight into the strategic management of sports events of all sizes and types. The module provides a framework of the sports event planning process, using short and long-term strategies, and an overview of operational strategies. By the end of this module students will not only have an enhanced theoretical understanding of the concept of sports event organisation and management and the importance of a strategic approach, but know how to implement strategies that can achieve successful sports events over the short and long-term. This module aims to provide students with a solid grounding in the theory and practice of research in sport management as preparation for the Leve 6 (year three) independent project and dissertation work. Students cover relevant theory from a research perspective and are presented with realistic research situations through which it is possible to consider different approaches to the study of sport management and the major research methods and techniques employed. The aim of this module is to provide students with an introduction to the tools of micro and macro-economic analysis as applicable to the context of managerial decision-making. The module outlines the fundamental financial and economic concepts underpinning the sport, and leisure industries. The aim of this module is to enable students to understand the principles of financial management specifically applied to the sport-related sectors. The students will be able to gain applied experience in the use of financial planning tools and to understand the importance using these tools in order to maintain success in a sporting organisation. This module will explore a range of contemporary issues within global sport and physical education contexts. Students will be enabled to develop original thoughts towards sociological theory, and apply this in the analysis of contemporary and current issues in physical education and sport. Students will critically review the cultural, environmental, political and historical backgrounds of different countries, as well as national organisations, systems and policies. Students will critically evaluate the impact of these factors on the physical and sport education systems in different countries. This module provides a strong background for individuals who intend to teach Social and Comparative Studies in A Level Physical Education or BTEC National. This module aims to equip students with the skills necessary to carry out effective and meaningful research in the field of Sport, Management and Business. Students will be introduced to the nature of research from both an academic and practical perspective and will develop a broad understanding of the methodology of research. The module will seek to place research into a conceptual framework that will allow for the practical application of project findings to current management practices. The aim of this module is to enable students to develop a deeper understanding of the management of elite/high performance sports personnel. The students will be able to gain applied experience in the management of elite athletes in terms of training, performance and career development. Also, the ability to market and promote high performance athletes to attract suitable sponsor funding. The module aims to explore key theoretical concepts in sport psychology. In addition, a number of new concepts and theoretical approaches are discussed from social psychological processes within sport. Through the presentation of theory and contemporary research in lecture sessions, the module aims to develop students’ critical understanding of this area of study. As a Sports Management graduate, you will have opportunities to work in many of the diverse sectors of the sports and leisure industries, such as working for professional sports teams and leagues, the sports marketing and sponsorship sector, the organisation and delivery of sporting events, managing health and fitness centres, and the growing field of Sport for Development. Making you career-ready is at the heart of everything that we do, and you will develop a wide range of general employability skills, such as communication, presentation, analysis, research techniques, teamwork and working to deadlines. The Careers Service has more information on careers and postgraduate study options available to Sports Management students who have started their studies at St Mary’s. There is also the opportunity to undertake a work placement as part of your degree. The Centre for Workplace Learning offers work-related modules that are embedded within your studies. We utilise a wide range of teaching methods. As well as highly interactive lectures, designed to develop a detailed understanding of key subject areas, you’ll receive presentations from top management professionals and practitioners within the sports industry. Following lectures, you will attend seminars that will deepen your understanding of the skills needed to be an effective manager. Individual tutorials offer one-to-one support from lecturers. These approaches are supplemented by an online virtual learning environment where you can find additional learning material. A variety of assessment methods will test your knowledge, understanding and skills development throughout the degree. The programme uses a broad range of assessments including business reports, essays, practical exercises, presentations, case studies, examinations, assessed blogs, seminar and simulation exercises. Additional costs could be incurred depending on optional modules chosen and other projects undertaken. For further information about additional costs please contact charles.little@stmarys.ac.uk. This module is designed to enable students to develop a solid knowledge and understanding of how sports news operates in the context of global communications. It will allow them to apply core principles of journalism to sports reporting and public relations. In addition students will be able to write about sport to a minimal professional and ethical standard. Finally students will have the opportunity to produce different types of sports media content for multiple platforms. This module aims to enable students to develop knowledge and understanding of online sports broadcasting. They will have the opportunity to apply the core principles of journalism to sports broadcasting. In addition, on completion of the module, they will be able to produce multimedia content to a minimal professional and ethical standard. Finally, the module will ensure they develop a range of transferable skills (including planning and organisational skills, creative decision making, team working, and problem solving). The aim of this module is to enable students to develop a deeper understanding of Sports Sponsorship and Promotion as it applies to the sector. The students will be able to gain applied experience in the use of sports marketing and promotion with respect to sports marketing tools, techniques and practises.